Right now I’m drowning in Magnolia and white gloss so quilting must wait. But it hasn’t stopped me thinking (I know, a bad habit). As I’m now concentrating on renovation and decoration, one thing really irritates me right now. Energy saving in average British house. All the UK media are screaming loud – save energy! Install new, energy saving windows and doors! Double glazing is the must! How about that hole in the wall? Yes, that one, called a fireplace. 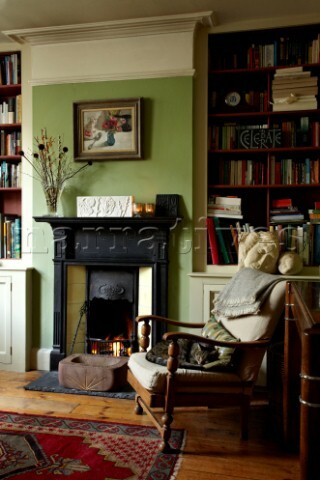 Fireplace is a must have in every British house. Designers call it a focal point of the British living room. Just close your eyes and imagine... Comfy armchair in front of that roaring fire with that British cuppa after a long walk in damp moors... Britishness to the essence, right? So every UK house has at least one. More or less decorated hole in the wall, leading right up into the open sky. Roaring? No, of course not. Wood is expensive and I suspect, half of population now has no idea how to lit one. So it’s better to leave that hole untouched. For that British dream, for the traditions. For that desired focal point (well, let’s be honest – nowdays the only real focal point in average UK household is that flat screen TV). Our house has two of these holes, called fireplaces. One is empty, hadn’t been used for at least past 20 years; other has a gas burner installed. And none have a damper!!! So the both holes are opened to the sky 24/7!!! So... How the nation is supposed to save energy by installing double glazing and packing layers of insulation in the attic while leaving two open holes in the house? How double glazing helps if you keep at least one window opened forever? Why there are no adds telling nation to sort out their fireplaces? Adds for installing a damper? I haven’t seen even one add! Damp issues? Well, UK is damp, I agree. But modern double glazing windows are made to breathe, to sort out these damp issues, right? Dampers are dangerous in hands of idiots when burning coal? Right. Fumes, I agree... So how many UK households use coal? I don’t know, as statistically it goes under “solid fuel” and includes wood as well. But, anyway, in 2013 solid fuel was used in only 0.8% of UK households! Less than 1 percent!!! (In comparison, in 1970 there were 39 % of households burning coal). So maybe it’s time to stop fooling around with these better and more expensive double glazing windows and doors and start energy saving with that hole in the wall? OMG! Don't you worry about rats or birds getting into the house? I've heard birds in our flue before, but they can't get in because of the damper. Oh, you need to investigate putting in dampers. Of all the things they have invented to save energy, you'd think that would have been a priority. Rant away! Most UK households (urban ones anyway) are not allowed to burn coal because of the pollution and most of the ones with pretty fireplaces have more than enough draughts to deal with ventilation issues!